Even though teenagers in this sleepy area might bemoan that there is “nothing to do” the reality is that you’ll find plenty of ways to spend enjoyable days near the South Fork. History buffs and picnickers should go check out the Gold Discovery State Historic Park, where, in 1848, gold was discovered and set off the spark that lit the Gold Rush–a rather massive event in US history. 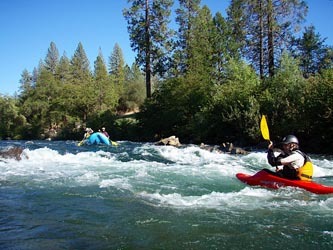 You can also head to the American River Resort and watch rafters, kayakers, and brave souls in inner tubes run Trouble Maker rapid with varying degrees of elegance and finesse. Day use fees apply. Venezio and David Girard Vineyards are local favorites wineries–or taste local olive oil at Gold Hill Olive Company. Easy day hikes/walks are nearby at Dave Moore recreation area and Greenwood Creek BLM. Winetasting in the California foothills is not nearly as famous at the Napa Valley, but there are three wineries within a couple miles of “downtown” Coloma. Because of the Mediterranean climate in the foothills, most wineries are known for their Syrah, Zinfandel and Sauvignon Blanc. Main street in Placerville is your classic Gold Rush era town with the west’s oldest newstand and hardware store, an outstanding used book store called The Bookery, and plenty of cute stores for browsing. Tasty coffee at Centro. Just a little further up Hwy 50 is Apple Hill, home to beautiful winding country roads, apple orchards, and wineries. Get a map or just wander and get lost in the beautiful scenery. Poor Red’s is home to the Gold Cadillac and BBQ’d ribs a strange yet beloved combo here in the foothills. If you’re feeling lucky check out the new Red Hawk Indian Casino. Capitol of the Golden State, Sacramento is perhaps not the coolest city on the planet, but it gets the job done. Get a Sacramento News and Review to see what’s happening–you’ll find everything from Argentine Tango to art museums to tasty exotic food, relaxed riverside parks and trails, cool nightclubs downtown and of course, the State Capitol Building, Museum, and grounds. Lake Tahoe is one of California’s natural gems–perhaps even a crowning glory, dare we say. The lake and surrounding mountains are stunning and there are lots of ways to explore them–hiking, bike trails, kayaking, swimming. There is also a summer Shakespeare festival, lots o’ gambling if you got money to burn, and of course plenty entertainment at the many casinos.